Mrs. Fillmore had grown ill by the time Mr. Fillmore took over the presidency after the death of Zachary Taylor. He was the second vice president to assume the presidency because of the death of a sitting president. President Fillmore’s daughter, Mary Abigail Fillmore, took over the First Lady’s White House hostess duties including all duties associated with the White House Christmas celebrations. The President’s daughter was an accomplished musician and would perform at several White House functions. Since the first Christmas cards were believed to be designed and printed in London, England just 10 years prior to the end of Millard Fillmore’s tenure as president, it is doubtful it ever occurred to President Fillmore or his wife to send White House Christmas cards. President Fillmore was born January 7, 1800 just after the Christmas season. This was just three weeks after the death of the nation’s first president, George Washington, which makes Millard Fillmore the first U.S. president to be born after the death of a former president. President Fillmore was the second of nine children but the first born son. He started his career as an apprentice for a cloth maker in Sparta, New York and moved on to another cloth maker in New Hope, New York after four short months. He was able to attend New Hope academy for six months at the age of 19. 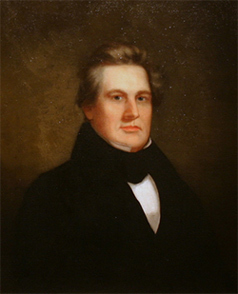 President Fillmore started his law career by clerking for Judge Walter Wood in 1819. He continued to study law and was admitted to the bar in 1823, just three years before he married Abigail Powers in 1826. His law firm, Fillmore, Hall and Haven, would later become one of western New York’s most prestigious law firms. Millard Fillmore’s political career began in 1828 when he was elected to the New York State Assembly, after which he served in congress from 1833 to 1842. Following an unsuccessful bid for Governor of New York, Millard Fillmore became the first New York Comptroller elected by general ballot. He was nominated as vice president in 1848 because he came from a non-slave state. Fillmore was selected with the hopes of healing a party divide over President Taylor’s nomination within the Whigs. President Taylor and Vice President Fillmore vehemently disagreed over the issue of slavery. Fillmore took over the presidency in 1850 after Taylor’s unexpected and untimely death. During his presidency, Fillmore faced increasing divide within his own political party. His years in the White House were tumultuous as the slavery debate continued over new territories and California entered the union, taking away from any Christmas celebrations that might have occurred during his time as president. 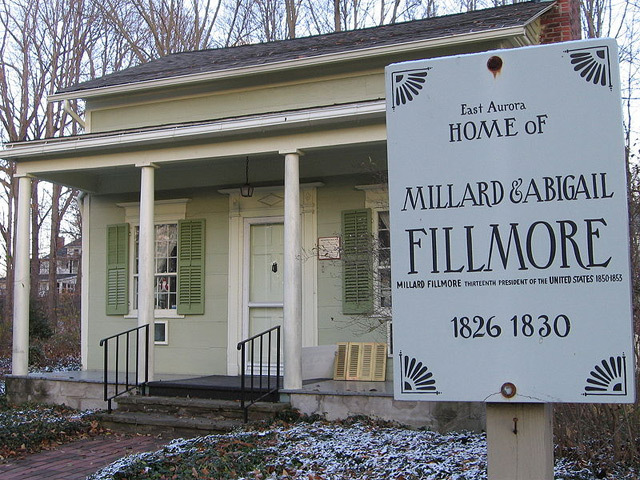 Millard Fillmore's East Aurora, NY home, where he spent several Christmas holidays with wife Abigail during the years when he practiced law. President Fillmore’s attempt to stay neutral between the northern and southern states caused greater divide and the Compromise of 1850 proved to be a truce that no one was completely happy with. He did not receive a consecutive nomination for a second term as president. In 1856, Millard Fillmore attempted to gain a second non-consecutive term as the presidential nominee for the short lived American Party but failed to win the election. President Fillmore’s wife would not live to see another Christmas after leaving the White House. Mrs. Fillmore had chronic health issues but insisted on standing by her husband’s side as his successor, Franklin Pierce, was sworn in. There was a raw northeast wind in the air and it snowed over the crowd. She returned to the Willard Hotel – chilled – and developed pneumonia. She died there on March 30, 1853. To show respect for the former First Lady and her family, The House of Representatives and the Senate adjourned as her body was taken home to Buffalo for burial. After returning to the United States he was unable to revitalize his political career. Mr. Fillmore met and later wed Caroline McIntosh, a wealthy widow. His son, Millard Powers Fillmore, never fully accepted the marriage. It was said that the years the former president spent with Caroline were happy and content. Millard Fillmore and Caroline McIntosh remained married until his death in 1874. I wonder what Christmas cards looked like back in the 1800’s. I can imagine how boring they must have been, compared to today’s. There were no photo cards, cartoony drawings, bright colorful designs and even those elegant cards with all the foil & embossing on them. 1800’s = boring cards! A lot of great information here with facts and history. I’m sure getting a christmas card from back in that era was very special considering that it was more difficult to send them out.